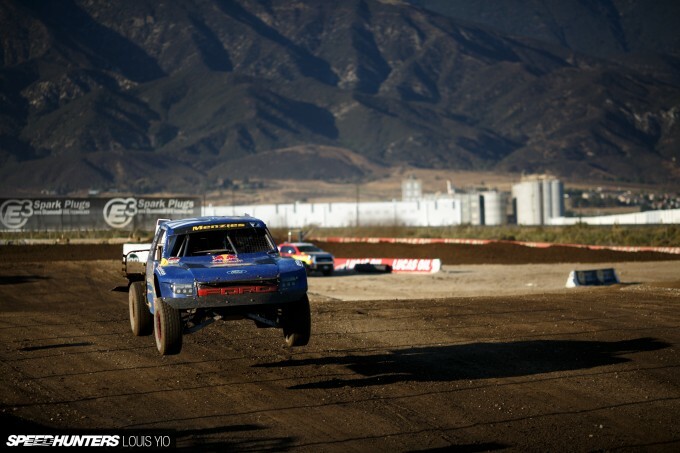 I love motorsports. 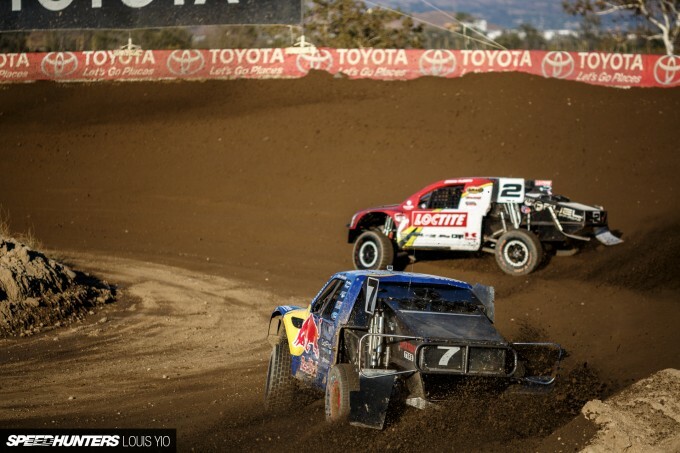 In this day and age, with all the different forms of racing, it’s hard not to. But there are the diehards who stick to what they know best and call all other forms of motorsport inferior. There are guys who like a little variety in their love for the sport. 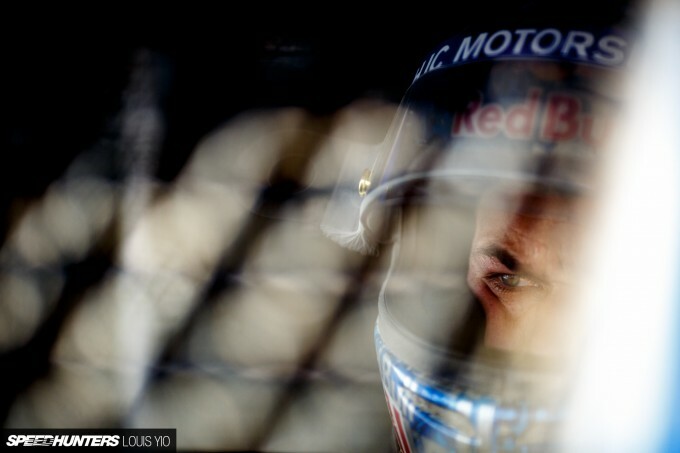 Then there are people like me (and hopefully you too) who love all forms of motorsport. 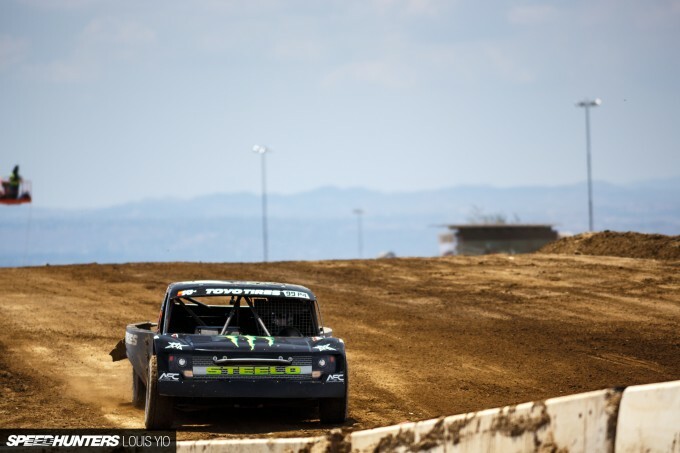 One thing I’ve been getting hooked on lately is off-road racing, and whether it’s traditional rally racing, rock crawling or trophy truck racing, they’re all amazing and awesome. 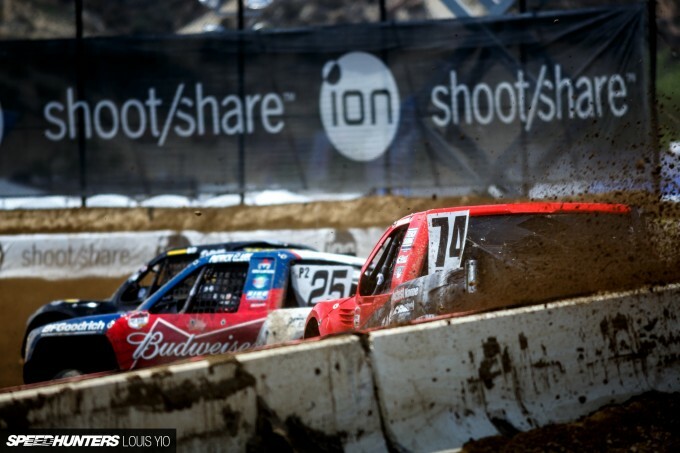 A few weekends ago, I decided to travel to Glen Helen in San Bernardino and catch rounds 9 and 10 of the Lucas Oil Offroad Racing Series (LOORRS). 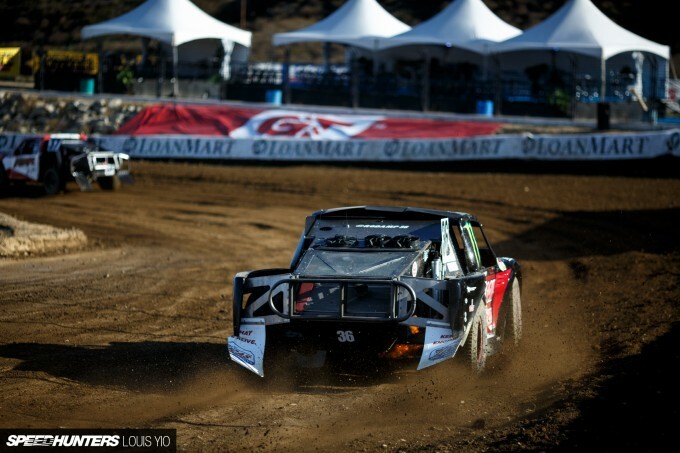 I’ve always known of the series, but because I’ve been fairly busy following the Red Bull Global Rallycross (GRC) championship I hadn’t been able to check it out. But when the opportunity presented itself, I snatched it. 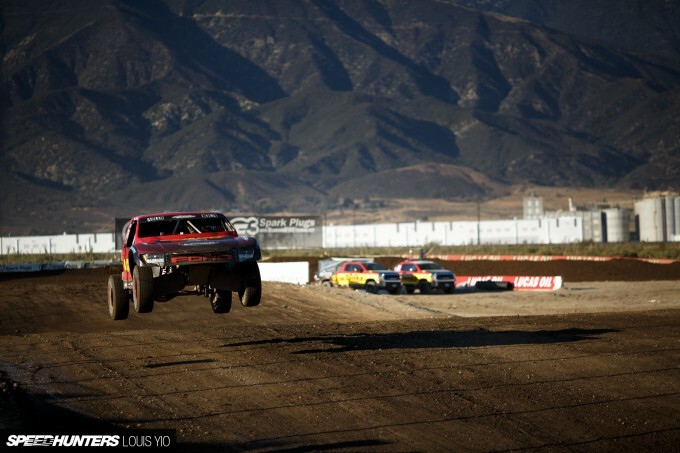 There are plenty of big-name drivers that compete in the series, like Brian ‘The General’ Deegan. 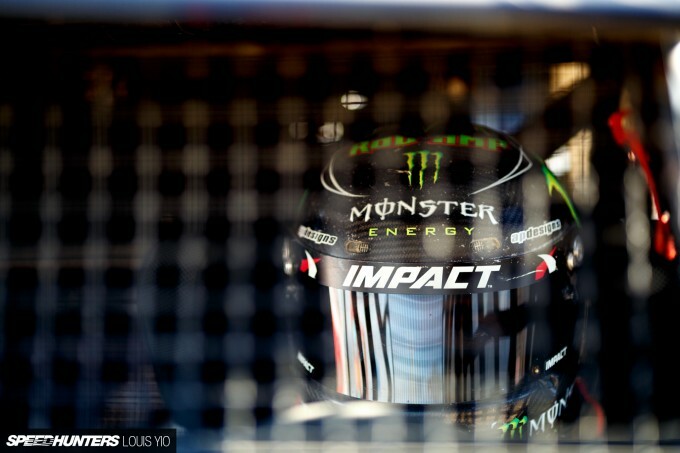 With the countless X Games medals he’s won, the Rockstar-sponsored driver is definitely a household name for many families in the US. His son is also a future motocross champion. 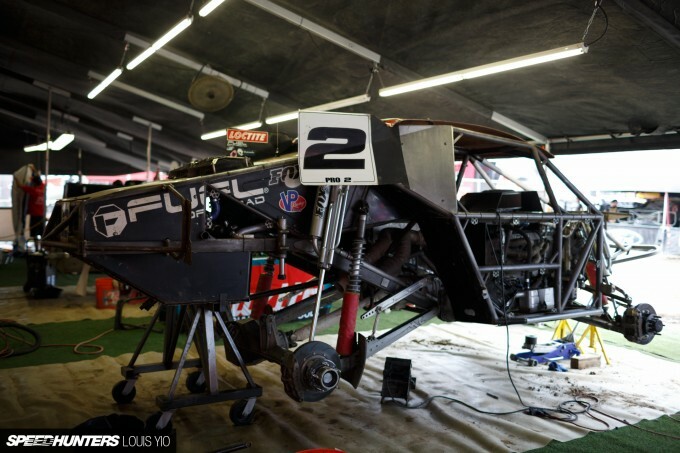 Then there is Bryce Menzies. 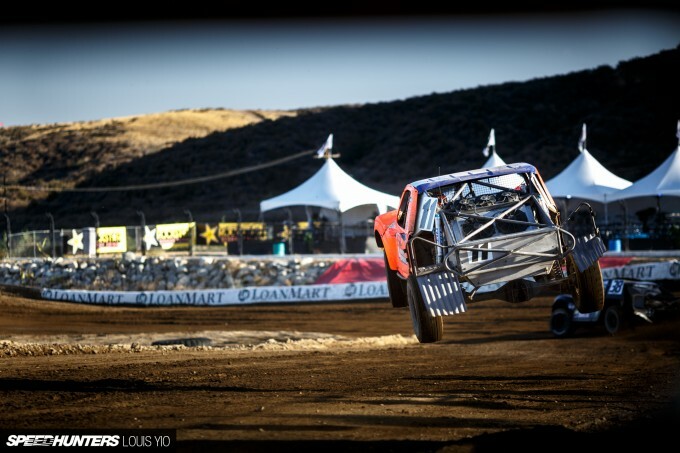 After winning the Mint 400 and finishing 1st three years consecutively in the Pro-2 class of the TORC series, he’s proved himself as one of the drivers to beat in the world of off-road racing. And he’s not even 30 yet! 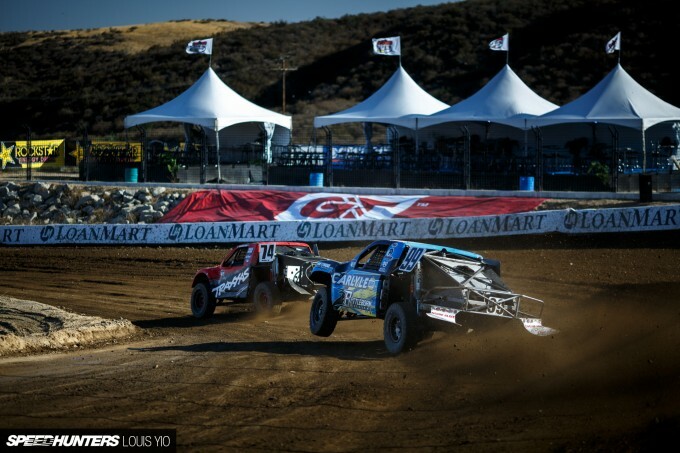 Menzies was leading the Pro-2 points going into the Glen Helen event, so all other drivers were out to get him. Tailing behind Menzies (by a mere 6 points) was Rob Maccachren. 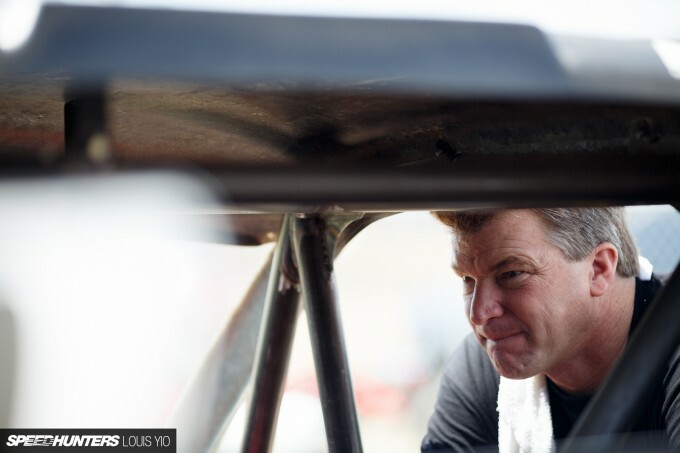 He was inducted into the Off-road Motorsports Hall of Fame in 2011 and has won the Baja 1000 not once, but two times, and has over 200 race wins to his name. He’s been racing off-road since before I was even born. 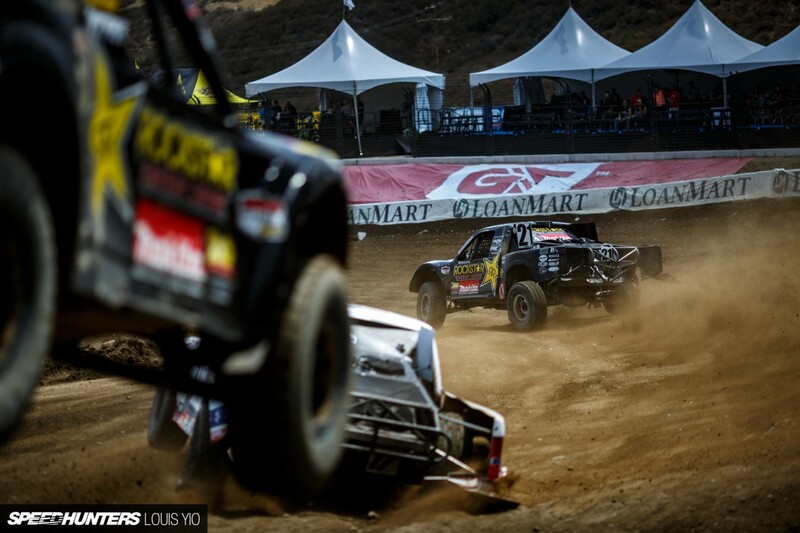 Things started out promising at Glen Helen, but there was a less than stellar ending. 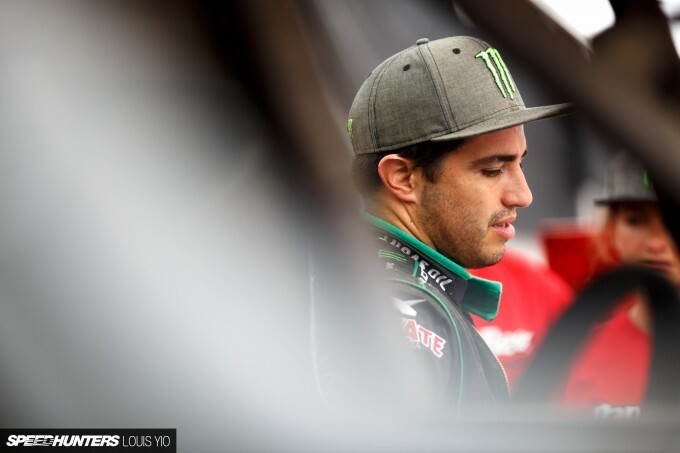 Each race weekend is basically two race events, but because of rain, both practice sessions, both qualifying sessions, and an entire race (Round 10) was cancelled for all classes. 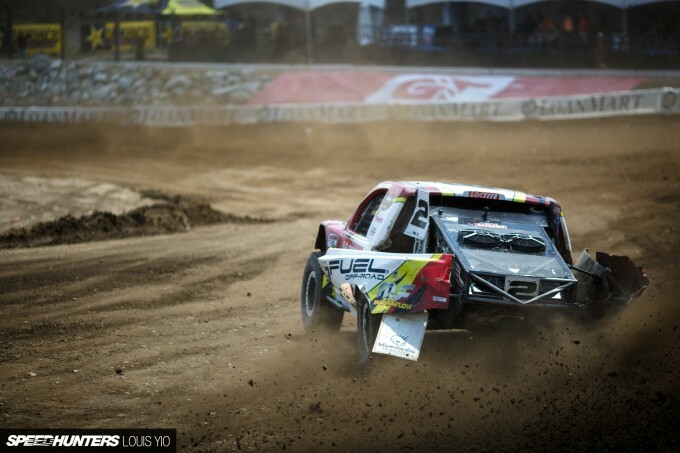 It was a bummer, but at least the series ran one of the two races on Sunday, so it wasn’t a complete loss. 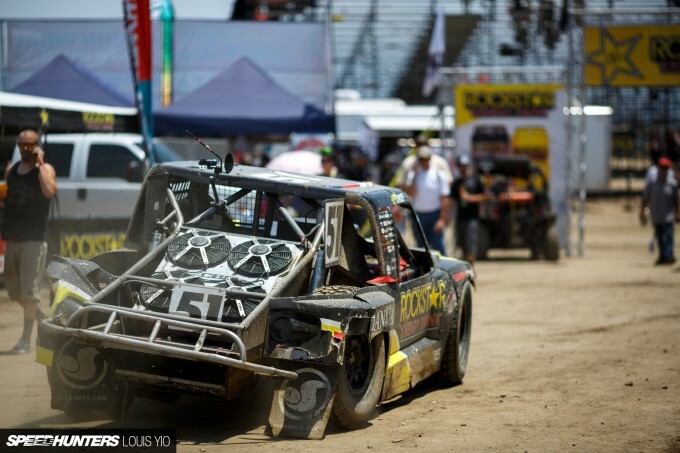 The first Pro race was the Pro-4 4WD class, and leading the points and absolutely dominating in this division was Kyle LeDuc. With the exception of the first round, LeDuc has won every other round this season, making it seven consecutive wins. Yeah, seven. Naturally, people had high expectations. Pro-4 was interesting to watch. Drivers would literally throw their cars sideways in the air while going into corners at full speed. They would then power through the corners with little counter-steer. 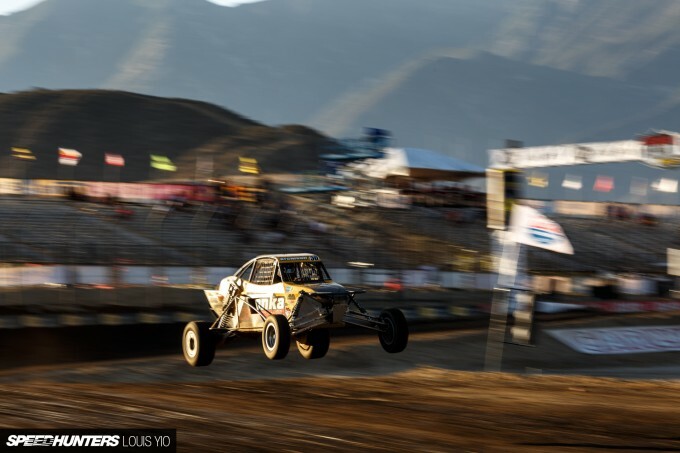 It was like watching rally cars, but instead of Fiestas and Polos there were giant trucks jumping well over 5-feet in the air on the smaller jumps. 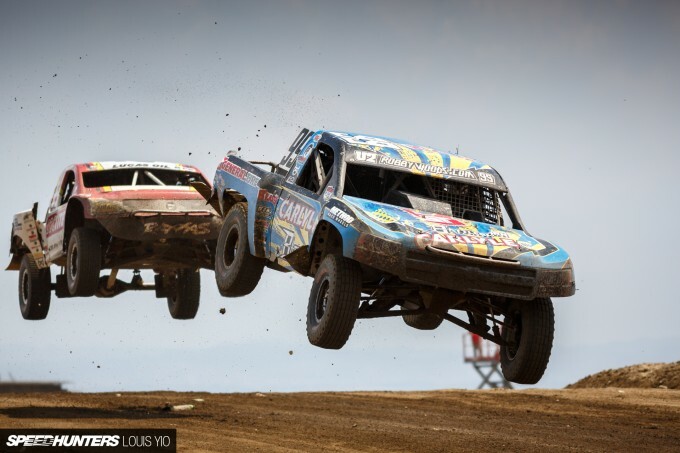 Just imagine how high they were going on the bigger ones… Even in the designated shooting locations, other photographers and I were still being hit by the dirt these trucks were able to kick up. As predicted, LeDuc won the race – and by an immense margin. 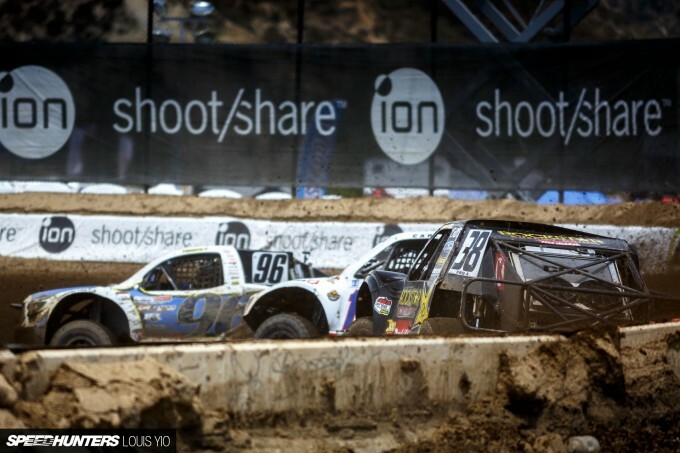 The battle for second and third is where the action was, and Deegan and Maccachren rounded out the podium. 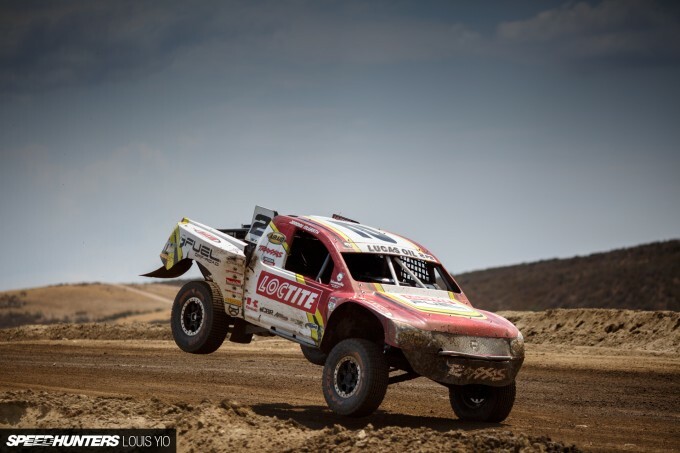 As I’m writing this, the next race in the series in Enseneda, Mexico, just took place, and guess who won back-to-back again? I’m telling you guys, this mad man definitely knows how to handle these Pro-4 monsters. Right after Pro-4 was Pro-Lite. 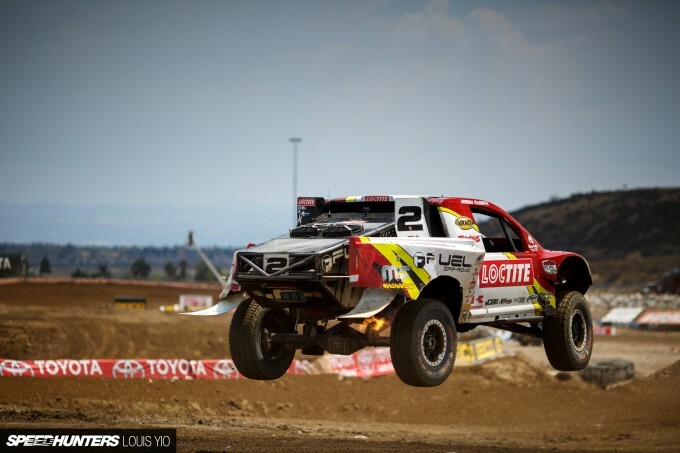 On paper the Pro-Lite cars are smaller and run less than half the horsepower of the Pro-2 and Pro-4 machines, but that doesn’t make them any less exciting to watch. 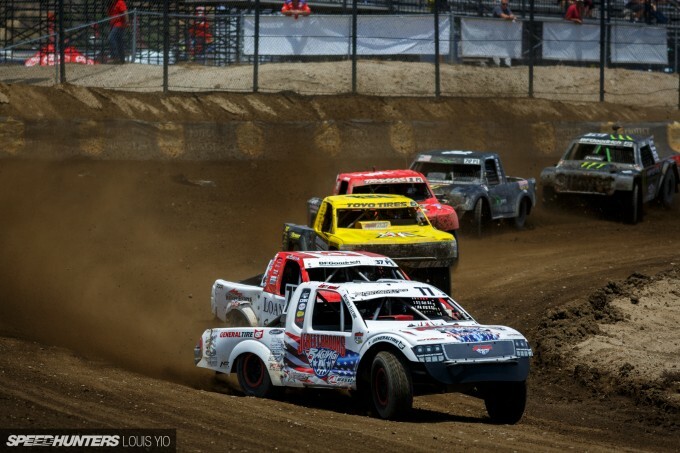 While all other Pro classes had between 10 to 15 drivers in the their final race, Pro-Lite had 27. 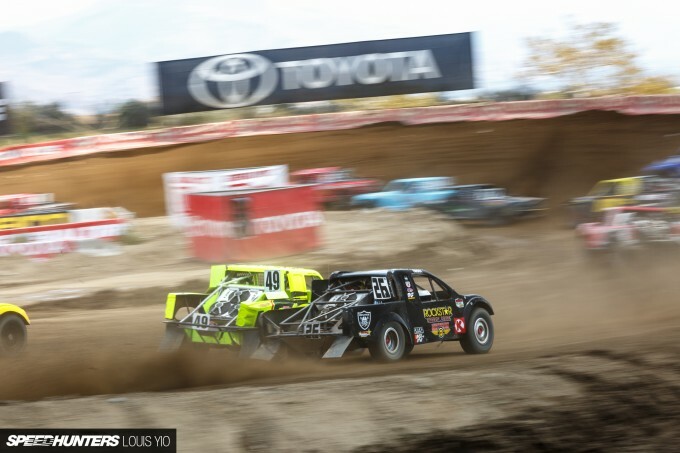 That might not seem like a lot when compared to other forms of motorsport, but keep in mind that this is short-course off-road racing. 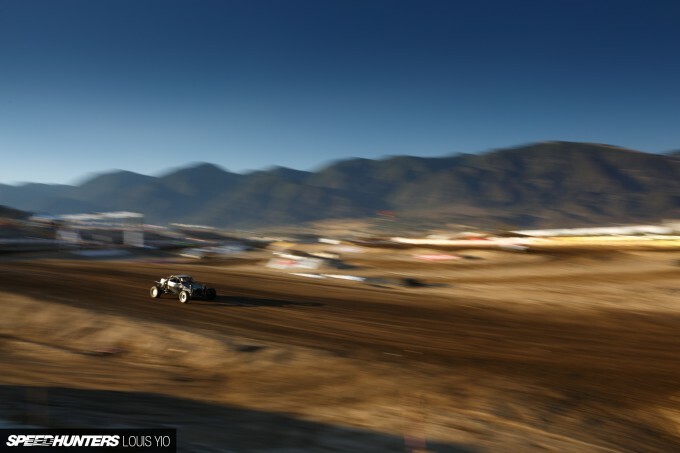 The Glen Helen track is only 0.8 miles long, so the picture above accurately represents what every corner is like for every driver in Pro-Lite – except for whoever is lucky enough to be leading the pack. Compare 27 cars on a 0.8-mile-long track to 27 cars on a 2-mile-long track and tell me which one would be more exciting to watch? 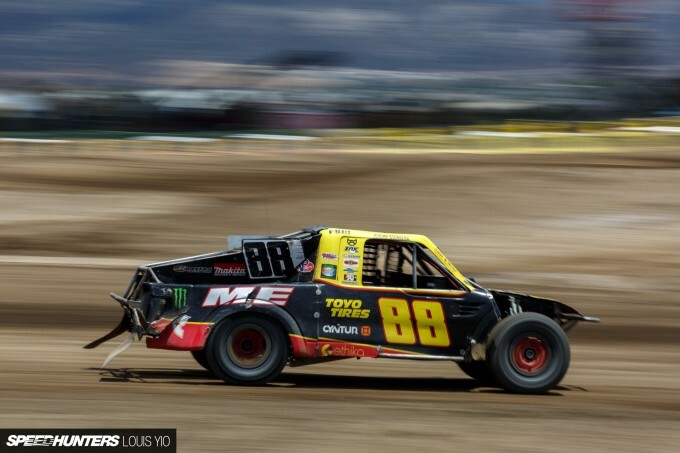 Casey Currie was on the hunt for another podium at Glen Helen, and coming into the event sitting 5th in the standings gave him a good shot at it too. And yes, there is a direct relation between Currie Enterprises and Casey Currie. 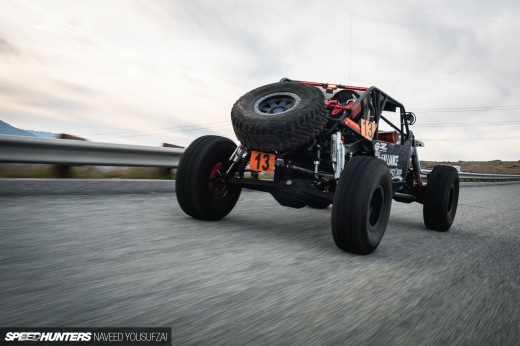 Larry featured Casey’s beefed up rock crawling Jeep a while back, and you can check it out here if you haven’t already. 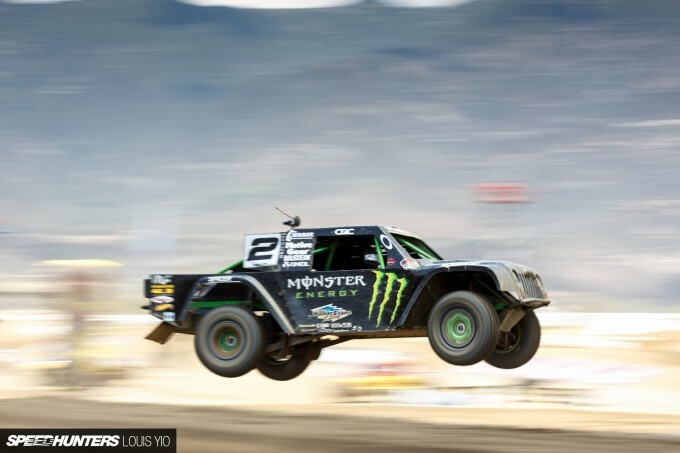 Casey’s younger brother, Cody, has recently been raising eyebrows in the off-road world. 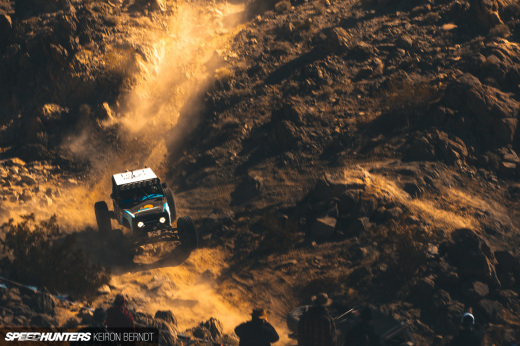 After finishing second overall in the UTV class at King of the Hammers this year – in what was essentially a stock UTV – people have been keeping an eye out for him. 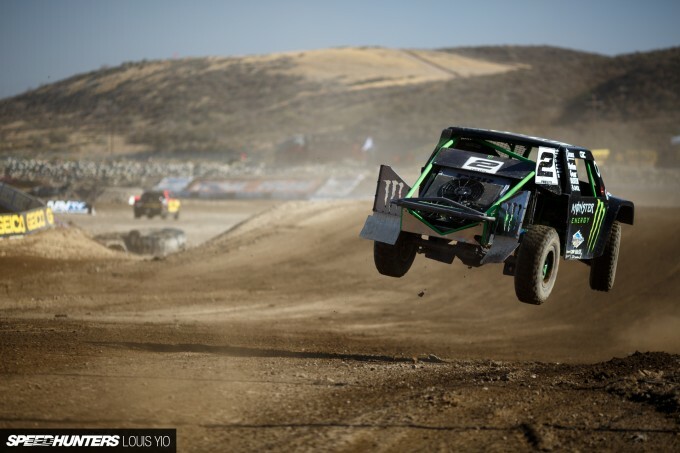 He recently got his Pro card, so Glen Helen was his first event driving in Pro-Lites. 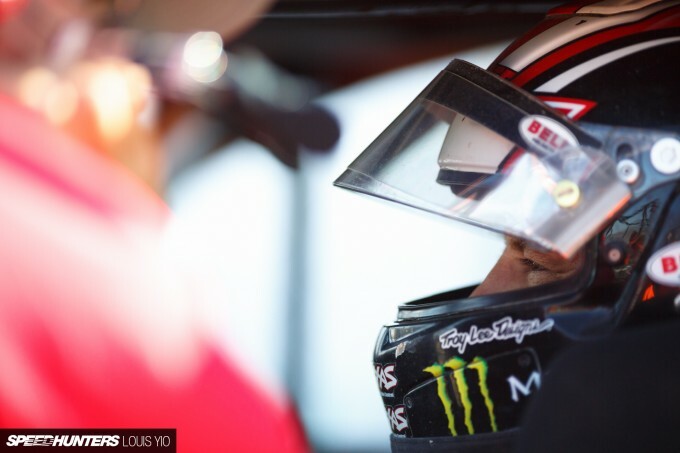 Because qualifying was cancelled, the series ran the grid according to the championship standings, so Casey thought it was better for Cody to sit this race out instead of starting from last place. 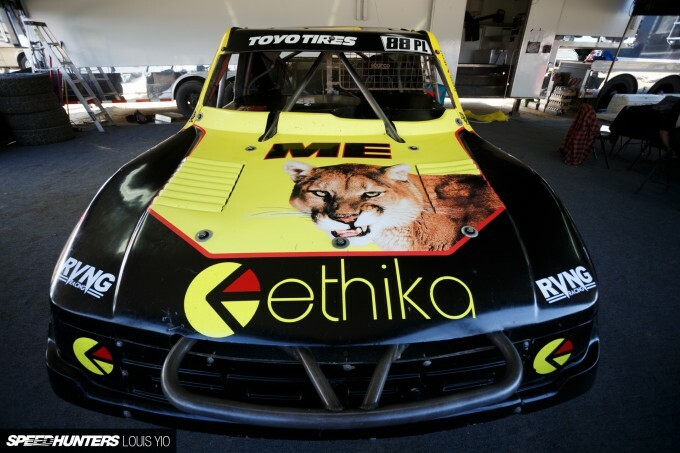 I had no idea Ricky Bobby was competing! 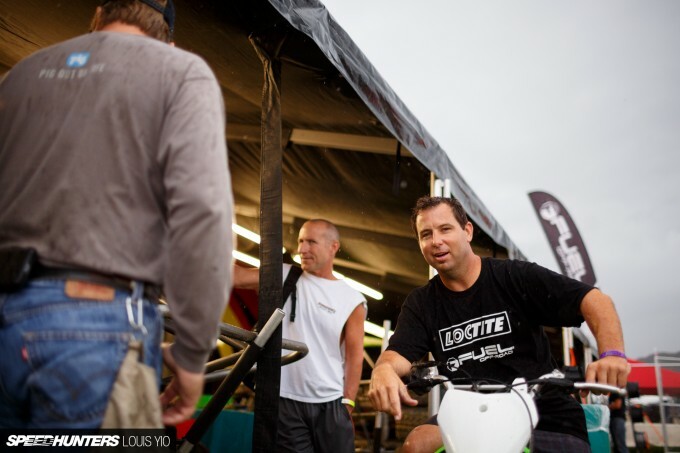 After finishing 1st in Pro-Lites in 2012, RJ Anderson has maintained a top three standing in the class. 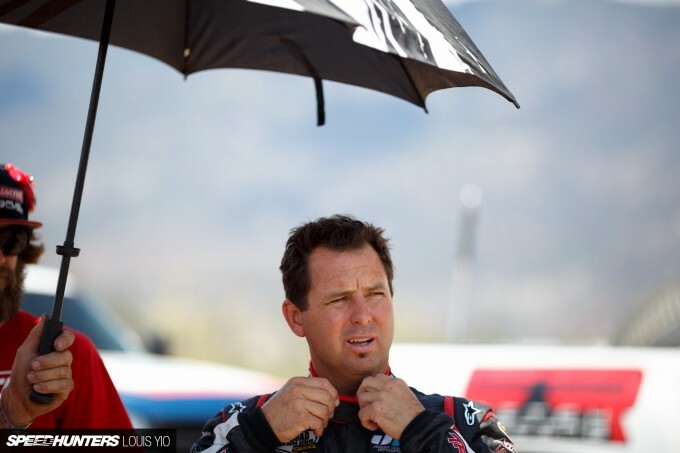 He was one of the few drivers running in two different classes, the other being Pro-2. After tailing the current points leader, Jerett Brooks, for the majority of the race and almost convincing me that he was going to land in 2nd, RJ snagged the 1st spot with just two laps left. Meanwhile, Twitch started the race in 14th position and within the 12 laps had made his way to 5th position. He didn’t podium, but making nine overtakes in that short time is extremely impressive. He most definitely harnessed his inner Ricky Bobby. 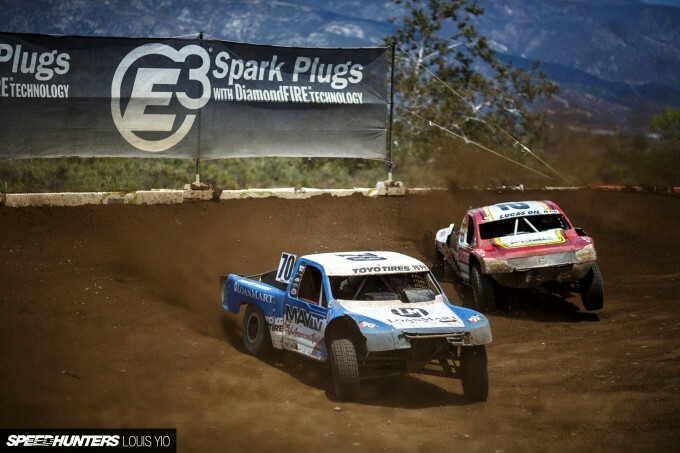 Casey took the last turn badly near the end of the race and dropped a position. 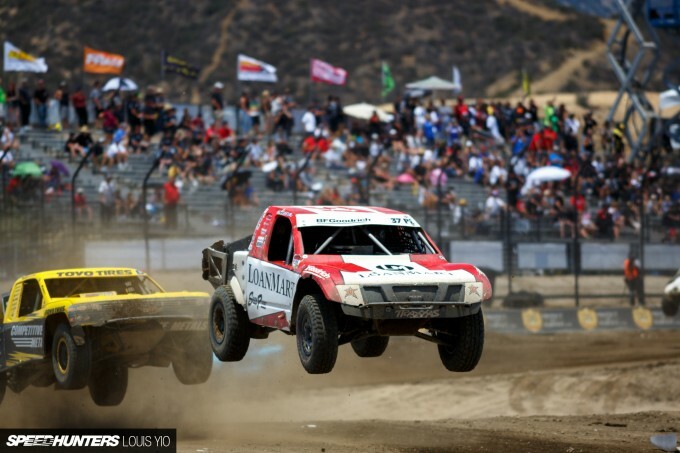 In Ensenada though, he made a comeback from his flop in Glen Helen and snatched the final podium spot in the Sunday race. 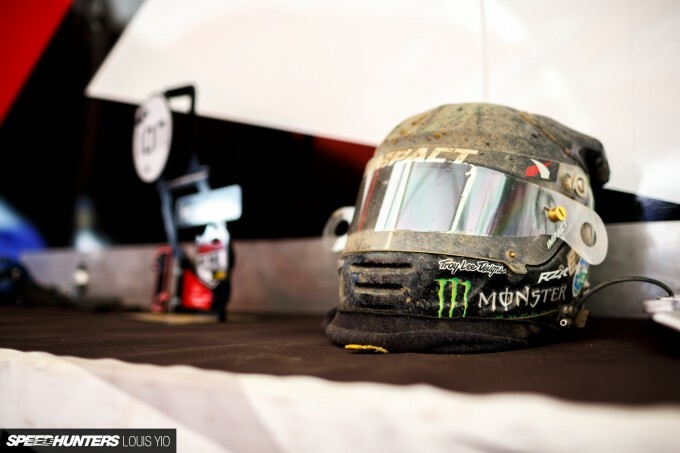 This was pretty much what every Pro-Lite vehicle looked like after the race. I wish I was joking. All the body panels are made out of fiberglass, so it’s not actually as bad as it looks. Just from walking around the pits, I noticed that each team had at least three or four spare pieces of each body panel for the race weekend. They head into these events expecting carnage. Smart. Now, at this point I pretty much ran out of water and had to go fetch some, so I was only able to catch part of the Pro-Buggy race. The water was good though… so there’s that. 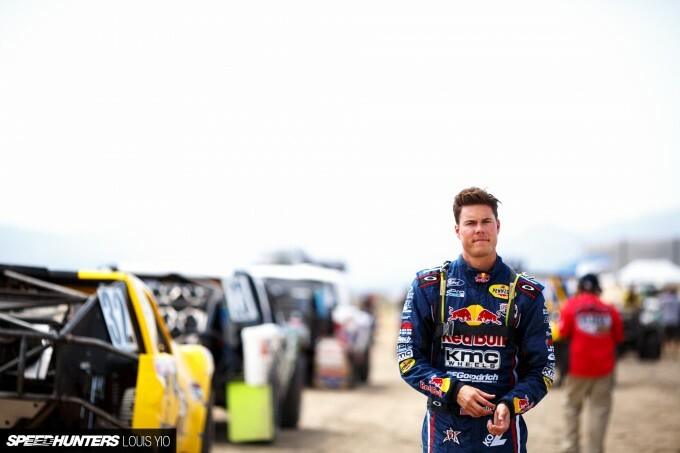 The man of the hour was Bryce Menzies. He was in search of another win. Right off the bat Menzies took the lead, but within two laps his car slowed because of mechanical issues and he pulled off track. Just like that, his race was over. 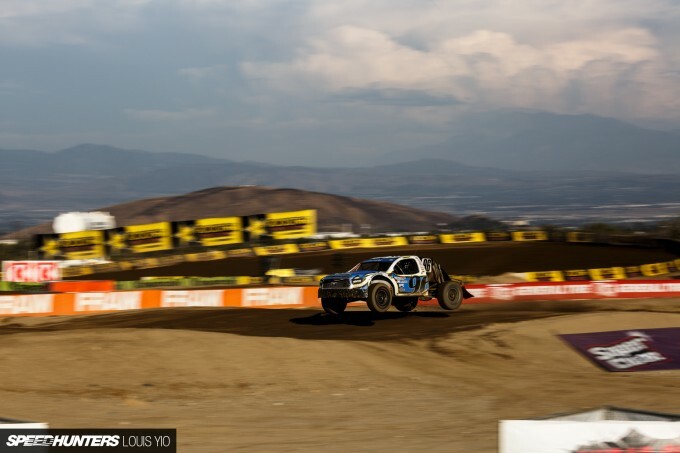 Maccachren took the lead and Rodrigo Ampudia followed, but Ampudia was struck with a similar problem to what Menzies had just a lap earlier, and he pulled off the track too. 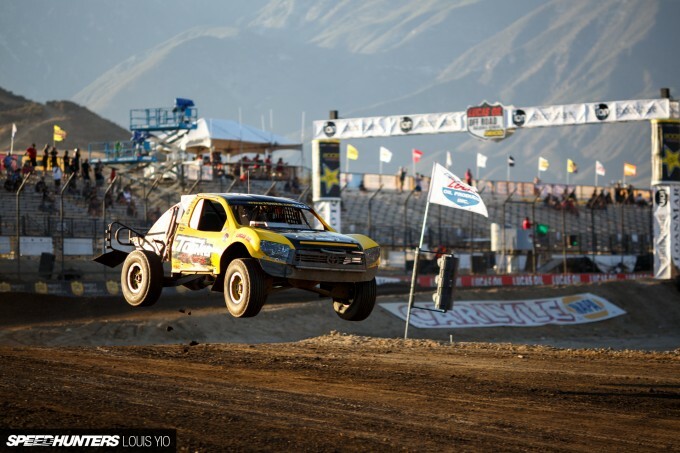 Jeremy McGrath, motocross champion of champions, was also out for a win. He started in third but almost spun in the second to last corner early on and was overtaken. He ended his weekend in 8th. 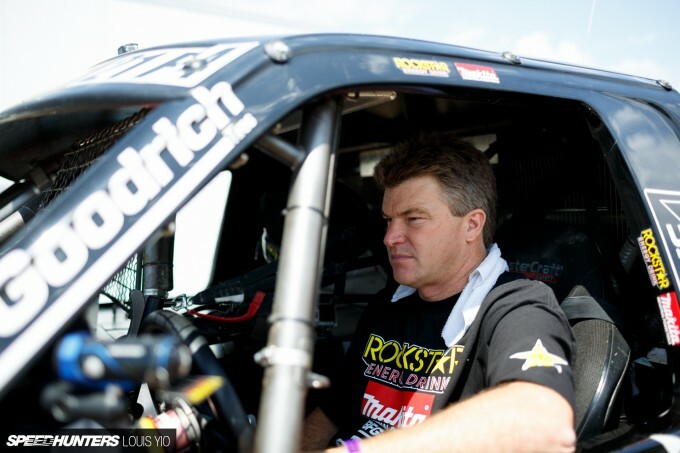 I’m sure McGrath will be back as he is a top competitor and has a few podiums under his belt as well. 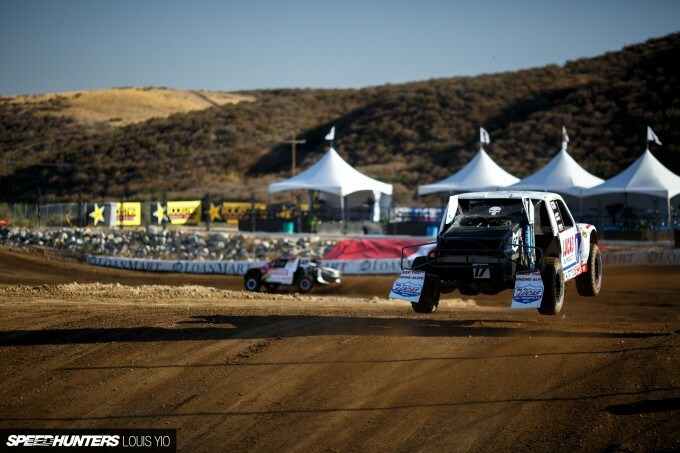 Maccachren ended up taking the win with Carl Renezeder and Brian Deegan rounding out the podium. 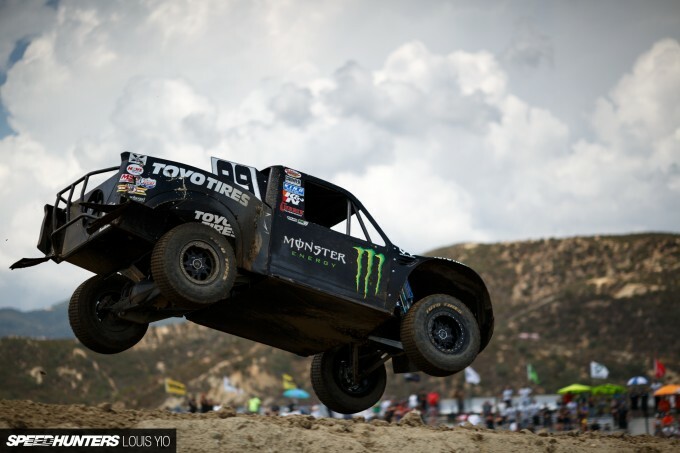 Anderson was still high off his finish in Pro-Lites and managed to move from 7th to 4th, just shy of the podium. 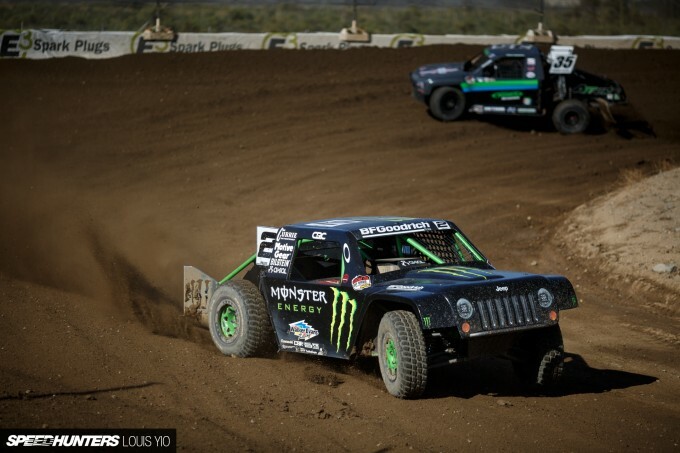 Both Maccachren and Deegan finished the weekend with double podiums in Pro-4 and Pro-2. They’re like a Rockstar tag-team duo, slaying everything else in their path. They had very similar results in Mexico as well. 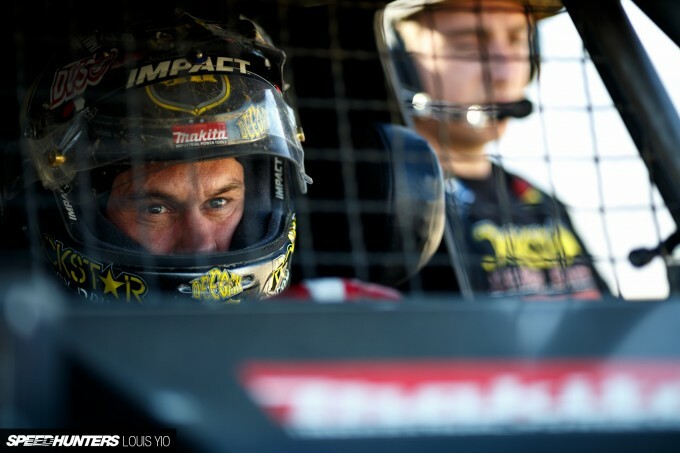 I wonder what it’ll be like when Tanner Foust jumps back into the seat for a couple more races, like he did earlier this season. 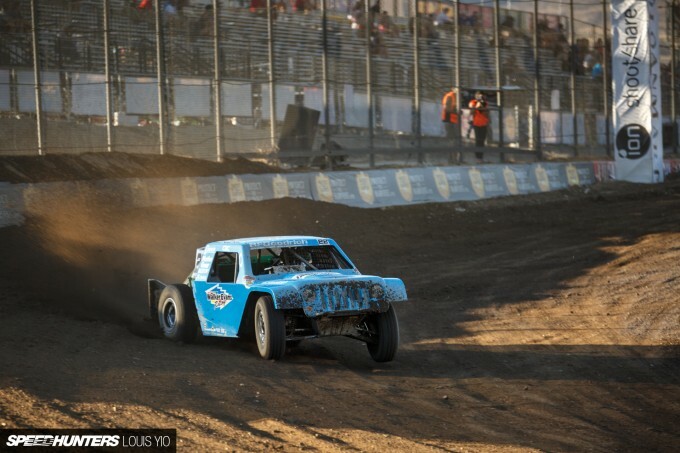 He’s done moderately well, considering this season was the first time he’s competed in a Pro-2 truck. 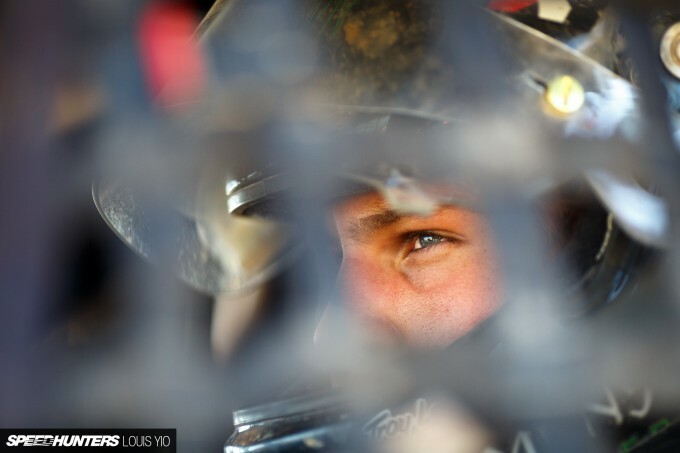 With Tanner’s rallycross championships, I’m sure he’ll fit right in with his Rockstar teammates. A 1-2-3 Rockstar podium? 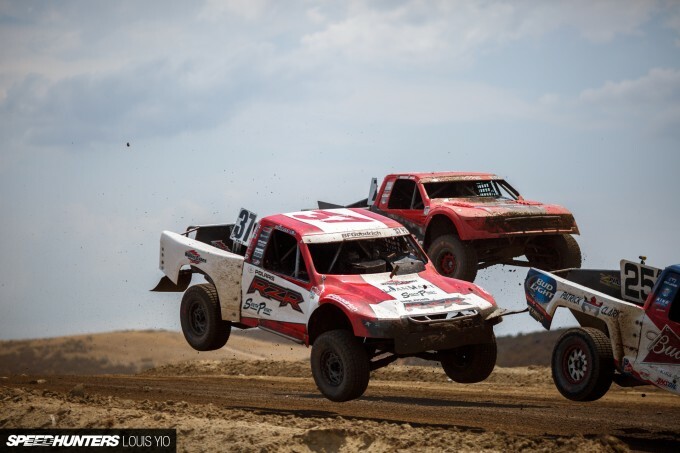 For you guys on the other side of the US who can’t make it to any of the LOORRS events, the TORC series is basically the East Coast equivalent of LOORRS, so check it out – you won’t be disappointed! I'm just wonder , if the engine underneath the sticker shell have anything related with the shell ? 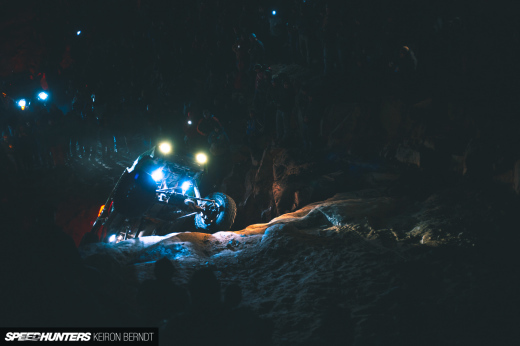 Thanks for shining some more light on Off Road stuff. Your pictures really captured a solid feel to experiencing an event like this. 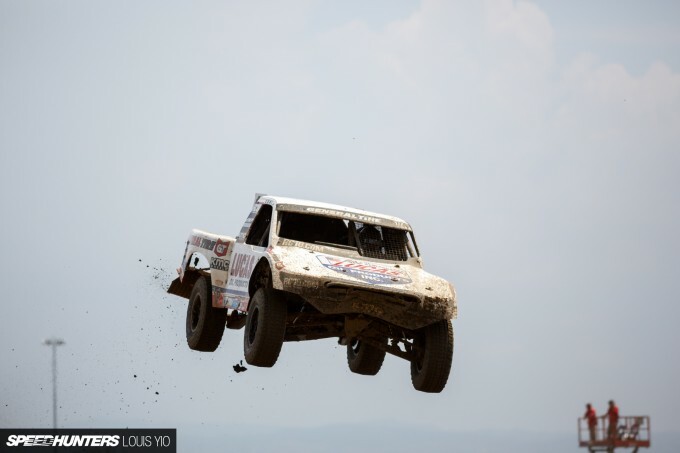 why would you cancel a off road event cause of rain? 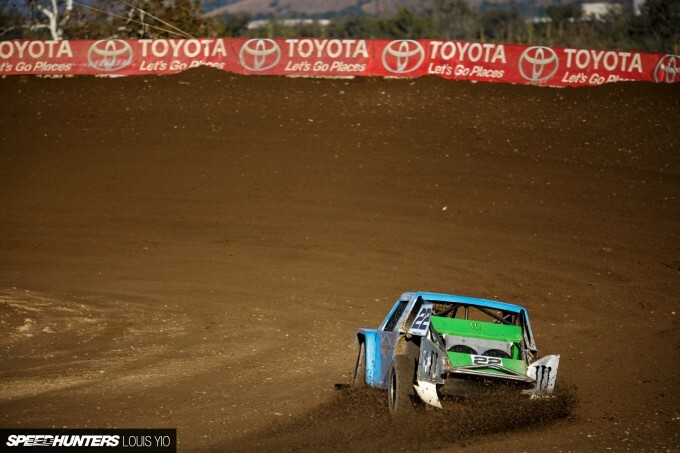 wouldn't it be just more awesome, i like mud. 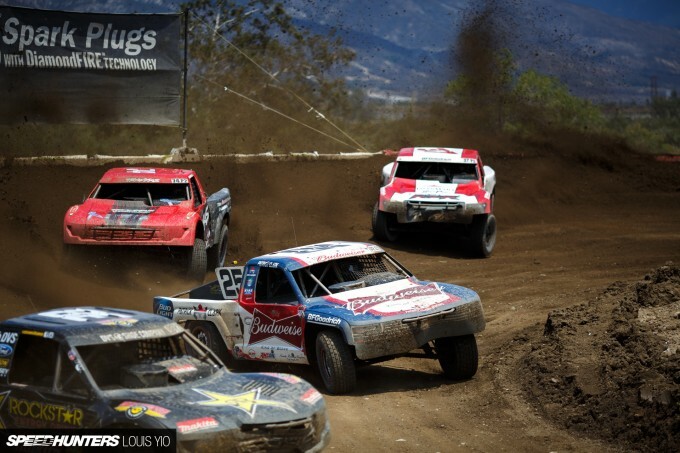 @truhidden The race trucks can run in the mud all day but if the safety trucks can't get around, then there's a problem. 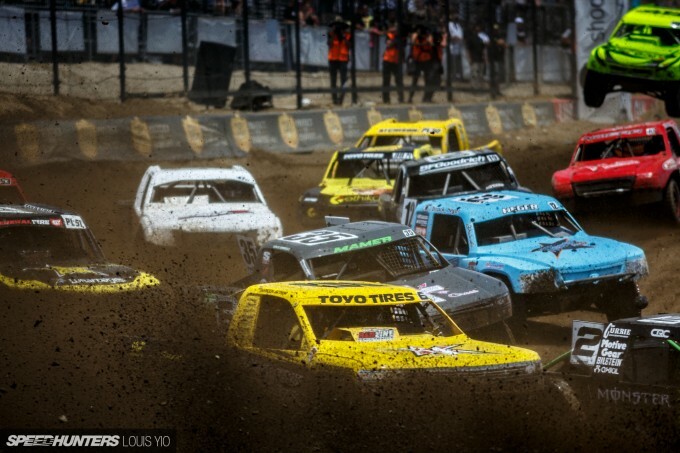 The officials make the call if they conclude that there is too much mud for the safety cars to drive in. @truhidden +1 The Irony is almost too much to bare! craigdodd Now that is one amazing cougar. Just image what the livery would look like on a Pro car. 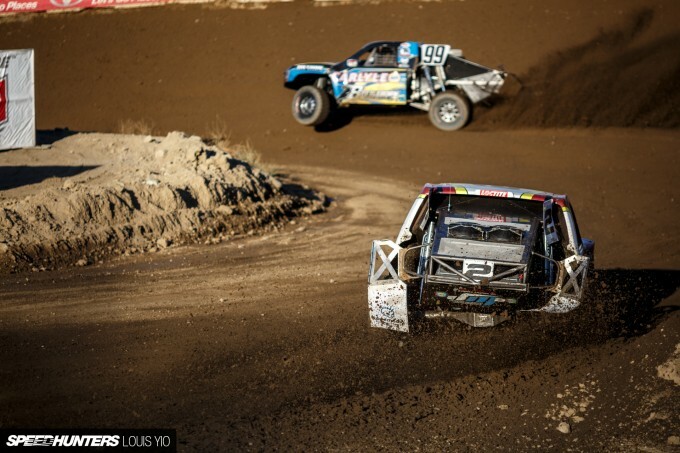 LOORRS is such an underrated Championship, if and when I ever travel to the US it's the top of my list of racing to check out. 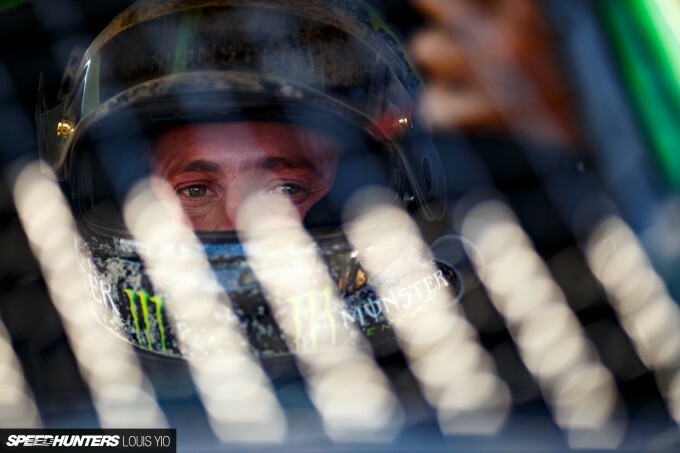 Brilliant to see it covered here on Speedhunter, more of this please! craigdodd Cheers Doddsy, beat me to it! Was going to look for Connor's #dlb2015 pics!